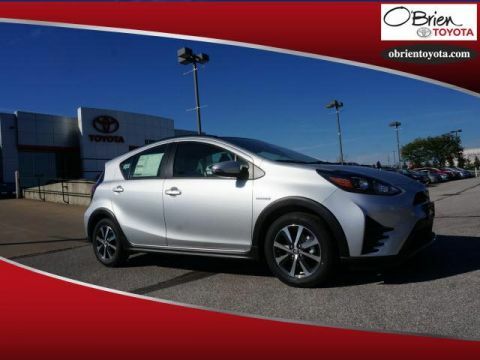 Prius c is the perfect road trip partner with a powerful Entune ™ Audio system, comfy seats wrapped in an eye-catching available two-tone interior fabric, and an available moonroof to let the outside in. It’s the perfect place to hang out with friends and brainstorm that next world-changing idea. 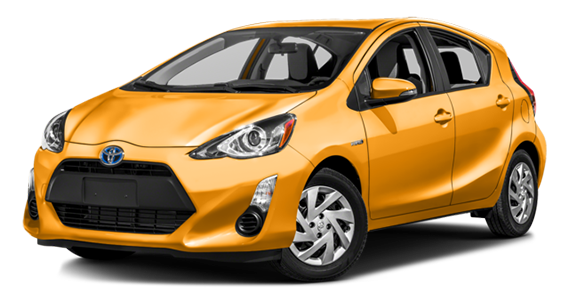 Thanks to its EPA-estimated 43 mpg highway and 48 mpg in the city1, Prius c makes sure the fun goes farther. Gas stations always look better when you’re driving past them. Know what’s cooler than one power source? Two of them. With our Hybrid Synergy Drive ®, you get a more efficient, more reliable combination of a gasoline engine and an electric motor. They work either independently or simultaneously, to move you in a the most efficient way possible. With Prius c, you can select the driving mode you want. Under certain conditions, in EV mode2, Prius c runs solely on battery power for up to one half mile. ECO mode helps maximize fuel economy by limiting the operation of the climate control and adjusting the throttle response. Prius c is rated as a Super Ultra Low Emission Vehicle (SULEV)3, a designation indicating it produces fewer smog-forming emissions than an average gasoline-powered new vehicle. 12017 EPA-estimated mileage. Actual mileage will vary. 2CAUTION! When driving a hybrid vehicle, pay special attention to the area around the vehicle. Because there is little vehicle noise in EV Mode, pedestrians, people riding bicycles or other people and vehicles in the area may not be aware of the vehicle starting off or approaching them, so take extra care while driving. EV Mode works under certain conditions at low speeds for up to one-half mile. See Owner’s Manual for details. 3Meets Tier 2/Bin 3 Federal emissions standard. It’s easy to get into your Prius c with style. With the available Smart Key4 fob in your pocket or purse, simply grasp either the driver’s or front passenger’s door handle of your Prius c to unlock it. Plus, the engine starts with the push of a button. Trying to set hypermiling record? You’ll want your eyes on the road. This available feature puts a duplicate image of steering wheel controls on the Multi-Information Display, so you know if you’re pressing the button you want. Hey, chilly nights are no excuse for not going out. Give your Prius c an added touch of comfort with available SofTex ®-trimmed seating with heated front seats. Plus, view your surroundings frost-free with available heated power outside mirrors. Take a hands-on approach. With steering wheel controls, you’re in commence of your audio, climate, Multi-Information Display and Bluetooth-equipped5 mobile phone, right from the steering wheel. 5 The Bluetooth® word mark and logos are registered trademarks owned by Bluetooth SIG, Inc., and any use of such marks by Toyota is under license. A compatible Bluetooth®-enabled phone must first be paired. Phone performance depends on software, coverage and carrier. No problem fitting your gear or your dog in the car. Prius c has plenty of room, thanks to the available 60/40 split fold-down rear seats. Not just 17.1 cu. ft. of cargo volume,6 but also a variety of ways to configure it. Prius c makes sure you leave nothing behind, especially your stuff. Bags, gear, kickball trophies – with 17.1 cu. ft. of cargo volume6 behind the rear seats, there’s a place for all of it. Lane Departure Alert (LDA)8 is designed to help you stay in your lane and help keep you safe from harm. Using a specialized camera, the system can detect visible painted lane markings on the road and will alert you if the system determines that you are starting to drift out of your lane. An audible beeping will sound and an indicator light on the instrument panel will flash so you can then take corrective action. The Automatic High Beams (AHB)9 system allows for enhanced visibility, helping make nighttime driving safe. Using a camera to detect oncoming vehicles’ headlights, Automatic High Beams can switch between high and low beams for you. 7The TSS Pre-Collision System is designed to help avoid or reduce the crash speed and damage in certain frontal collisions only. It is not a substitute for safe and attentive driving. System effectiveness is dependent on road, weather and vehicle conditions. See Owner’s Manual for additional limitations and details. 8Lane Departure Alert is designed to read lane markers under certain conditions, and provide visual and audible alerts when lane departure is detected. It is not a collision-avoidance system or a substitute for safe and attentive driving. Effectiveness is dependent on road, weather and vehicle conditions. See Owner’s Manual for additional limitations and details. 9Automatic High Beams operate at speeds above 25 mph. Factors such as a dirty windshield, weather, lighting and terrain limit effectiveness, requiring the driver to manually operate the high beams. See Owner’s Manual for additional limitations and details.